I enjoy wrapping gifts. It's kind of "my thing." But as much as I like pretty packages, I don't want to be up all night Christmas Eve cutting and taping. I try to relax and get to bed at a decent hour because I know I'll be awakened bright and early the next day! So what's a super simple way to avoid the stress of an all night wrapping session? Years ago, I started wrapping gifts as I purchased them. The task was spread out which resulted in less stress, and our tree looked even more beautiful with wrapped packages underneath. If you had to choose just one "signature" wrapping paper, what color or design, would it be? 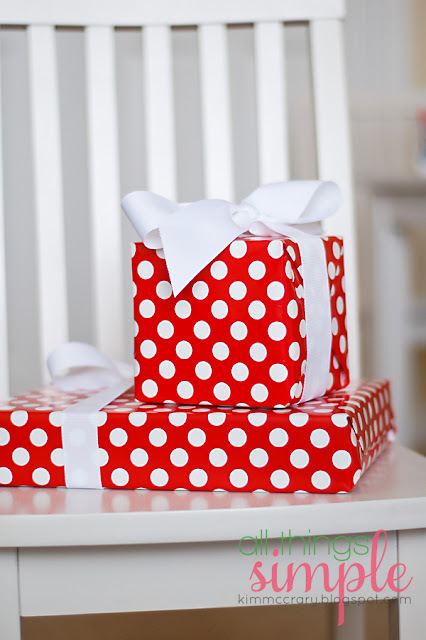 A few years ago, I started using the same paper--red with polka dots--for all my gift wrapping. It may seem boring, but I found one style feels more designer-ish and pretty. 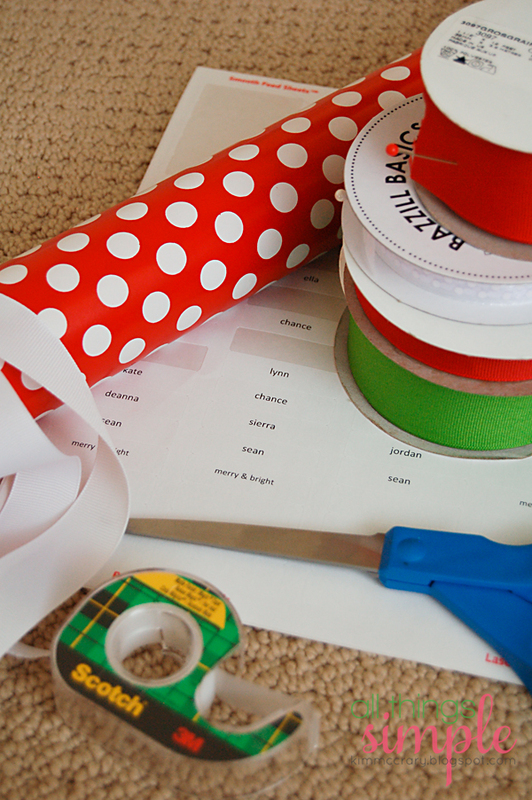 One or two large rolls of good quality paper go a long way in simplifying wrapping. Bows using nice ribbon is a bonus. I order large rolls of grosgrain inexpensively from here. Don't be chintzy with the ribbon, it makes a big difference in how polished your packages will look. Instead of tags, I print labels and adhere them to the bottom of packages. When my bigs were younger, I would wrap each child's gifts in a different paper. They never knew which design or pattern was theirs until Christmas morning, so it made things fun. And with no tags necessary, it saved time. Speaking of fun, my friend Jen, and her husband Carlisle, decided to play a little joke on their kids last year. They wrapped all the gifts, put tags on them, then wrapped each one again inside a larger box, adding a tag with a different name. Get it? The kids would open a gift, only to find out it was for a sibling. They thought it was hilarious. It wouldn't actually simplify things, but I was totally busting up when Jen was telling me about it. I also use either one or two rolls of paper in the same color way. Each year I chose a colour theme for the tree and paper and then go with that. It looks much better than having assorted colours under the tree. It's how the magazines style their trees.